What is brunch without mimosas (or brunch sangria)? Just a normal old weekend breakfast. Not that I’m opposed to that.. but sometimes you just need to liven things up a bit! This Brunch Sangria with Mint and Pineapple was designed to do exactly that. 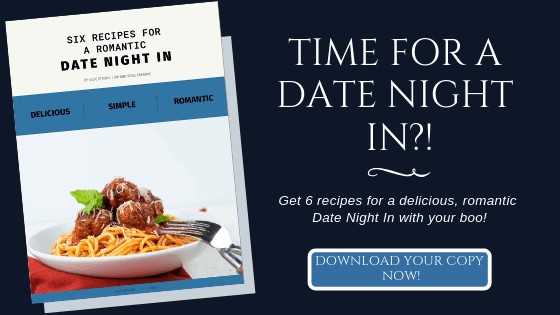 It’s super easy to prep ahead (read: the night before) and then serve up in the morning. Normally, sangria is mixed together, wine and all and left to sit and marinate together for a few hours. 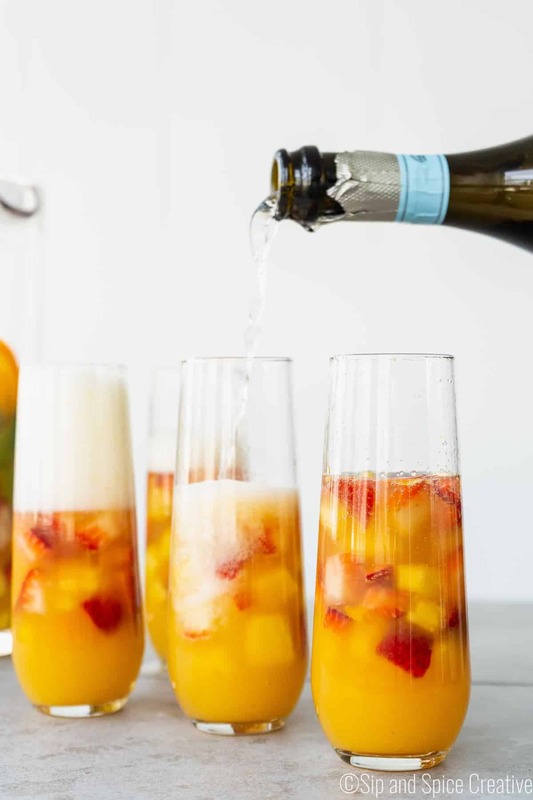 But since this is Brunch Sangria, we need a little bubbly up in here, no? So instead, we simple let the fruit, juice and Triple Sec cozy up together for a few hours, then we pour it into glasses and top it off with the bubbly. Looking for an Easter Brunch cocktail that serves a crowd (or a few fun people!)? 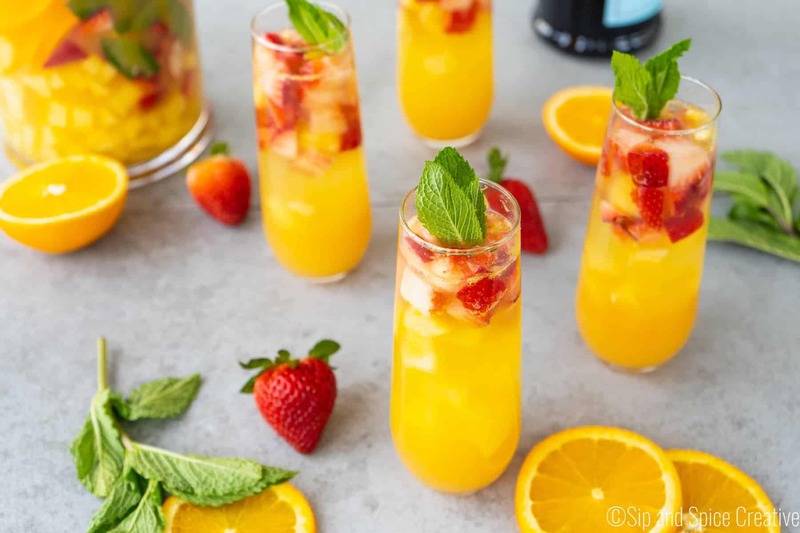 These Brunch Sangria Mimosas with Mint and Pineapple will be perfect! 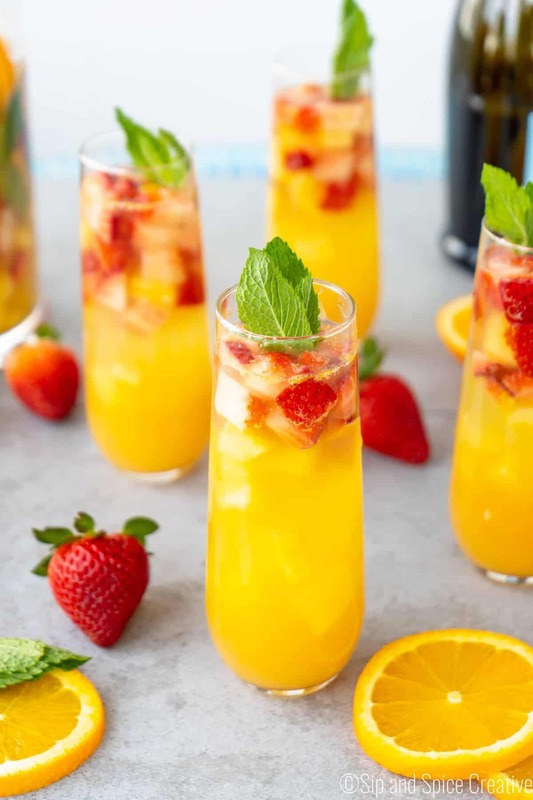 Simply layer up your pineapple, strawberries, orange, mint, pineapple juice, orange juice and Triple Sec and let it sit for a few hours or overnight. Then in the AM, top it off with the bubbly and let the Easter fun begin! What I love about this combo is that the mint brings a big pop of freshness to the whole pitcher. 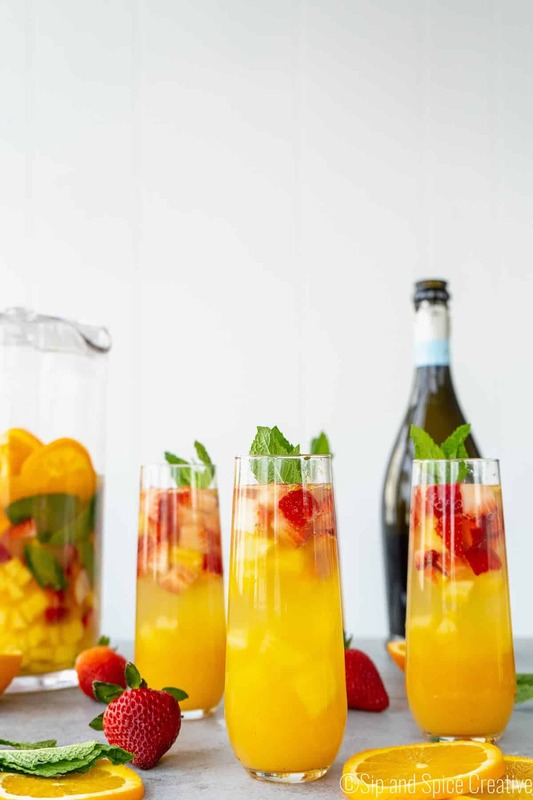 In a large pitcher, layer the pineapple, strawberries, orange slices and mint sprigs. Pour in the pineapple juice, orange juice and Triple Sec. With a wooden spoon, carefully mix together and slightly muddle the fruit. Place in the refrigerator for at least 1 hour. When ready to serve, spoon 1/4 of soaked fruit into each glass, then fill glass up 1/3 full with juice. Top with Prosecco and garnish with a mint sprig. This looks absolutely gorgeous and delectable. I cannot wait to try it.